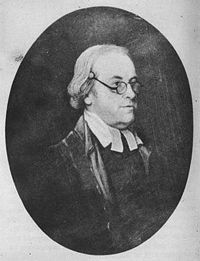 David Hartley (June 21, 1705 – August 28, 1757) was an English philosopher and founder of the Associationist school of psychology. He provided a materialistic approach to empiricism by seeking to explain the development of thoughts as a physical function in the human brain. However, his physical and psychological description of the development of the human mind has at its core a spiritual component and purpose of the development of the human spirit and salvation. David Hartley was born in June 1705 in the vicinity of Halifax, Yorkshire. His mother died three months after his birth. His father, an Anglican clergyman, died when David was only fifteen. He was educated at Bradford grammar school and Jesus College, Cambridge, of which society he became a fellow in 1727. Originally intended for the Church, he was deterred from taking orders by certain scruples as to signing the Thirty-nine Articles, and took up the study of medicine. Nevertheless, he remained a member of the Church of England, and was on intimate terms with the most distinguished churchmen of his day. He considered it his duty to obey ecclesiastical as well as civil authorities. The doctrine to which he most strongly objected was that of eternal punishment. Hartely was married twice. The first time in 1730 to Alice Rowley, who died the next year giving birth to their son David (1731-1813). His second marriage was in 1735 to Elizabeth Packer (1713-7878). This marriage was undertaken in spite of the opposition of Elizabeth's influential and very wealthy family. This union produced two additional children, Mary (1736-1803) and Wincombe Henry (1740-1794). Hartley practiced as a physician at Newark, Bury St Edmunds, London, and lastly at Bath, where he died in 1757. His principal work Observations on Man, his Frame, his Duty, and his Expectations was published in 1749, three years after Condillac's Essai sur l'origine des connaissances humaines, in which similar theories were expounded. It is in two parts—the first dealing with the frame of the human body and mind, and their mutual connections and influences, the second with the duty and expectations of mankind. His two main theories are the doctrine of vibrations and the doctrine of associations. His physical theory, he tells us, was drawn from certain speculations as to nervous action which Isaac Newton had published in his Principia. His psychological theory was suggested by the Dissertation concerning the Fundamental Principles of Virtue or Morality, which was written by a clergyman named John Gay (1699—1745), and prefixed by Bishop Law to his translation of Archbishop King's Latin work on the Origin of Evil, its chief object being to show that sympathy and conscience are developments by means of association from the selfish feelings. The outlines of Hartley's theory are as follows. Like John Locke, he asserted that, prior to sensation, the human mind is blank. By growth from simple sensations, those states of consciousness which appear most remote from sensation come into being. And the one law of growth of which Hartley took account was the law of contiguity, synchronous and successive. By this law he sought to explain, not only the phenomena of memory, which others had similarly explained before him, but also the phenomena of emotion, 'if' reasoning, and of voluntary and involuntary action. A friend, associate, and one of his chief advocates, was Joseph Priestley (1733-1804), the discoverer of oxygen, who was one of the foremost scientists of his age. Hartley's physical theory gave birth to the modern study of the intimate connection of physiological and psychical facts, though his physical theory in itself is inadequate. He believed that sensation is the result of a vibration of the minute particles of the medullary substance of the nerves, to account for which he postulated, with Newton, a subtle elastic ether, rare in the interstices of solid bodies and in their close neighborhood, and denser as it recedes from them. These sensations are meant to be understood in a very broad meaning of the term as senses, thoughts, feelings, etc. Thus the feeling of pleasure is the result of moderate vibrations, pain of vibrations so violent as to break the continuity of the nerves. These vibrations leave behind them in the brain a tendency to fainter vibrations or "vibratiuncles" of a similar kind, which correspond to "ideas of sensation," which accounts for memory. The course of reminiscence and of the thoughts generally, when not immediately dependent upon external sensation, is accounted for by the idea that there are always vibrations in the brain on account of its heat and the pulsation of its arteries. The nature of these vibrations is determined by each man's past experience, and by the circumstances of the moment, which causes one or another tendency to prevail over the rest. Sensations which are often associated together become each associated with the ideas corresponding to the others; and the ideas corresponding to the associated sensations become associated together, sometimes so intimately that they form what appears to be a new simple idea, not without careful analysis resolvable into its component parts. Despite the materialistic ontology of Hartley's philosophy, this was all within a framework of his own deep religiosity associated with the Unitarian views of becoming one with the divine, and to embody the universal commandments of Jesus of love for God, and love for others. He himself opposed the idea of eternal damnation in hell, and propounded the idea that such a theory of Hell was inconsistent with the belief of a God that provided universal salvation. His physical and psychological description of the development of the human mind has at its core this spiritual component and purpose of the development of the human spirit and salvation. Anon., An Introduction towards an Essay on the Origin of the Passions, in which it is endeavored to be shown how they are all acquired, and that they are none other than Associations of ideas of our own making, or that we learn from others (1741). Conjecturae quaedam de sensu, motu, et idearum generatione, Appendix to De Lithontriptico a Joanna Stephens nuper invento Dissertatio Epistolaris (Bath, 1746); repr. in Samuel Parr (ed. ), Metaphysical Tracts by English Philosophers (1837); trans. Robert E.A. Palmer. Various Conjectures on the Perception, Motion, and Generation of Ideas, with an Introduction and notes by Martin Kallich (Augustan Reprint Society, Publication no. 77–8, Los Angeles, 1959). Anon., An Enquiry into the Origin of the Human Appetites and Affections shewing how each arises from Association, with an account of the entrance of moral evil into the world, to which are added Some Remarks on the Independent Scheme, which deduces all obligation on God’s part and Man’s from certain abstract relation, truth, &c. (Lincoln, 1747; repr. in Samuel Parr). Observations on Man, his frame, his duty, and his expectations. In Two Parts (1749; 2nd edn, trans. from the German, with A Sketch of the Life and Character of David Hartley by his son David Hartley, 1791; 1st edn repr. with an Introduction by Theodore L. Huguelet, Delmar, New York, 1976). Prayers and Religious Meditations (Bath, 1810). David Hartley also published numerous medical works. Ferg, Stephen. Two Early Works of David Hartley, Journal of the History of Philosophy. vol. 19, no. 2. April 1981, pp. 173–89. James, William. The Principles of Psychology. New York, 1890. Walls, Joan, The Philosophy of David Hartley and the Root Metaphor of Mechanism: A Study in the History of Psychology, Journal of Mind and Behavior. vol. 3, 1982, pp. 259–74. This page was last modified on 10 November 2017, at 22:54.